Paratilapia bleekeri female female in the aquarium. Photo by David Tourle. The Paratilapia genus of Madagascan cichlids contains two of the most attractive species to be found on that forgotten island. The conservation status of these fishes is highly endangered as are most other Madagascan cichlids, due to the destruction of most of their natural habitat. Another problem has been the introduction of 'foreign' species (i.e. tilapia and snakeheads), to help feed the population of one of the world's poorest countries. Paratilapia polleni are sometimes seen in the hobby whereas Paratilapia bleekeri are only rarely to be found. The colouration of both these fishes from a small size and when breeding, is a gorgeous velvety black, with attractive gold and blue spots on the body and in the tail and dorsal fin. When the fish were first brought to Europe and the USA, it was assumed that they were the same species, but with regional differences. 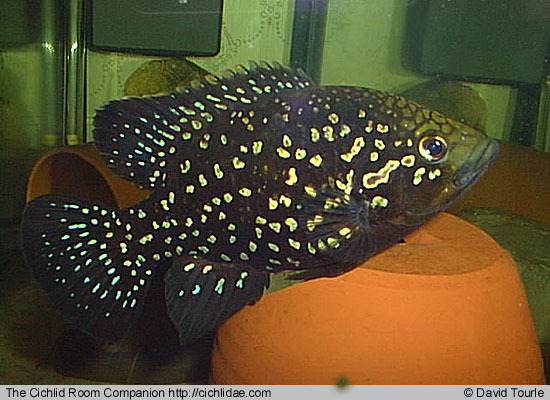 Some specimens had large spots whereas others displayed small spots, so both types became known as Paratilapia polleni "small spot" or Paratilapia polleni "large spot".
" Paratilapia bleekeri is a larger fish than Paratilapia polleni, and can reach 30 cms when fully mature "
In the USA a few years ago, a tropical fish wholesaler from New Jersey was maintaining both 'spot' variations which gave him an opportunity to observe them side by side. He noticed a distinct difference in both behaviour, size and fright colouration which made him certain that, rather than being the same species, the fishes might well be two different ones. As a result of following scientific investigation to determine anatomical differences, it was established that the small spot variant was the species originally described as Paratilapia polleni Bleeker, 1898 and that the large spot variant was a distinct species. The name Paratilapia bleekeri Sauvage, 1882, (honouring Bleeker who described polleni), was revived and applied to the latter form. Paratilapia bleekeri is a larger fish than Paratilapia polleni, and can reach 30 cms when fully mature, with males larger than females. My single, juvenile female Paratilapia bleekeri is already about 18 cms TL and is still growing whereas my male Paratilapia polleni has remained at about that same size for over two years. It is fairly obvious now that he will not grow any more. The female Paratilapia polleni is considerably smaller than the male, being only about 12 cms, but this could also be due to the fact that she has spawned about five times. At the moment there is a very handsome fully grown male Paratilapia bleekeri, who is currently doing extremely well on the show fish circuit for his owner, Kevin Rodway. This male is apparently about 30 cms TL. He was owned by my partner, Dave and I a few years ago and was one of a group of wild caught P. bleekeri that we purchased from a friend in Wiltshire. This friend apparently purchased all these fish in France and they were probably the first to be seen in the UK. They certainly caught my eye on all of several visits Dave and I made to his very large fish house which always contained many rare gorgeous cichlids from various parts of the world, but mainly the Rift lakes of Africa. Paratilapia polleni male male in the aquarium. Photo by David Tourle. As with all Madagascan cichlids, it is very important and advisable to give these fishes as much space as possible but obviously the two species should not be mixed together. We tried this once in the early days, but as World War 3 was in the offing, the Paratilapia polleni were quickly removed to another large tank. Paratilapia bleekeri are fairly tolerant of other cichlids and I have kept them with both Malawian Haps and the more peaceful neotropical cichlids. They do not like their own kind, unless a very large tank with many hiding places is provided for the smaller ones. While they can cope being housed with some juvenile Central American cichlids, I certainly would not recommend it, nor with Mbuna either. Because they are crepuscular feeders, somewhere to "hide" during the day is very much appreciated by these fishes. Crepusular fishes are most active at daybreak and early nightfall when their distinctive colouration comes into play. I have watched the female Paratilapia bleekeri patrolling in the evening half-light and she's as well camouflaged as a tiger that hunts at that same time of day. She is very much a stealth hunter, peering into crevices in the rocks in her tanks and 'sneaking' under pieces of wood. Her actions reminded me very much of the Malawian species, Dimidichromis compressiceps. For this reason other tank mates should be of a reasonable size. Having said that however, it is very noticable that the P. bleekeri are much more outgoing in temperament, than the P. polleni. My female reminds me very much of an Oscar in character as she always watching what is going on around her in the fish room and is hand-tame, showing no fear whatsoever. The male P. polleni hides for most of the day in his tube, [typical male!) but the female, who shares the same tank is out and about a lot more, but has sufficient hiding places to keep out of the male's way, whenever necessary. The decor in all our Madagascans tanks consists of a sandy substrate, rocks, Mopani wood and plants, with the obligatory hiding places. As we do not have a centralized system, the tanks are filtered mainly with large internal power filters, plus a few additional external power filters where necessary. The water temperature is kept at 26° C (79° F) for the older Madagascans and at about 27° C (81° F) for the juvenile species and this seems to suit all of them. The p.h. of Brighton water is about 7. 7 alkaline, and hard (GH 15 dH) but Madagascan cichlids seem to very tolerant of any water, provided it is are not too extreme either way. Jean-Claude Nourissat, who is the President of the French Cichlid Association and has made many fish collecting trips to Madagascar, Central America and South America, has succeeded in breeding many Madagascan cichlids. He and his very good friend, Patrick de Rham, who accompanies him on his expeditions, have done a great deal of good work in the conservation of Madagascans cichlids. In recognition of their achievements and the discovery of new cichlid species, in all three locations, fishes have been named after them. Amphilophus nourissati, which Jean-Claude discovered in Central America, as well as the dwarf, Archocentrus nanoluteus. Aequidens patricki, which was first located by Patrick in Peru is one of the several species named after Patrick. Also, the gorgeous Lamena nourissati, (Red Lamena) found on one of Jean Claude's Madagascan journeys. Last year, my partner, Dave and I were lucky enough to visit Jean Claude at his home in the South of France and have the opportunity to see his huge aquariums, which are so large he has to snorkel in them to clean them. As well as massive tanks containing Madagascan cichlid species, he also had massive tanks full of very large Central American cichlids. All these fishes were living peacefully together, mainly due to the sheer size of the aquaria. It was interesting to note that Jean-Claude was maintaining all his fishes in similar water conditions to mine. There are a few Madagascans that live in brackish water in their natural habitat, but so far none of these have been seen in the UK. He was keeping those species in fresh water with the rest, which must be another good indication of how adaptable all these Madagascan fishes are to varying water conditions. Paratilapia polleni female in the aquarium. Photo by David Tourle. As Paratilapia polleni and Paratilapia bleekeri are piscivores by nature, they relish earthworms when available, but will also eat absolutely anything. I feed mine with frozen bloodworm, mysis, brine shrimp [for the smaller species] and also ocean-plankton, which they particularly enjoy. They are also fed a selection of good quality dried food, just to keep their diet as varied as possible. Obviously, it is not a good idea to keep them with much smaller fishes, particularly P. bleekeri. Unfortunately, I did not succeed in breeding any of the aforementioned P. bleekeri group, but have had success with the pair of P. polleni, raising fry on more than one occasion. As, I have already said, both species need as much space as possible in which to live and to encourage them to breed. At spawning time the colouration will intensify considerably, especially that of the female. Shaking of heads in a nose down position is part of the pre-spawning ritual, with some digging of the substrate. A certain amount of tail-slapping and bodily contact reminiscent of the courtship that is seen in other neotropical cichlids also occurs. The female usually chooses the spawning site, with all other tank mates being kept at a distance by both prospective parents. The non-adhesive eggs are usually laid in a hollow on a piece of wood, although it has been known for spawning to occur in a pit on the substrate. On one occasion, my breeding pair of P. polleni spawned and the eggs, which are on strands, were attached to some plastic plants, located in one corner of the tank. The large clump of eggs greatly resembled frog-spawn, and once they have been laid, the female fans them with great enthusiasm, while the male patrols the surrounding area.
" Unfortunately, Madagascan cichlids are notorious for eating their eggs in captivity, which certainly does not help their endangered status "
Unfortunately, Madagascan cichlids are notorious for eating their eggs in captivity, which certainly does not help their endangered status. It is, therefore, essential to remove most of the eggs to be hatched artificially in another tank and this is how Dave and I have succeeded in raising P. polleni fry. He has constructed an artificial hatcher similar to the one pictured in Ad Koning's book, "Enjoying Cichlids" and it works very well. Methylene Blue was added to the water in the hatching tank to prevent the eggs from fungusing and the temperature was maintained at about 27° C (81° F). The fry will hatch after two or three days and should be free-swimming after another seven days. As they are so tiny, they will need to be fed on microscopic food like Waterlife Invert food or OSI Fry food. They grow quickly and should soon be able to take baby brine shrimp and cyclops. Raising the fry from the last P. polleni spawning, I noticed that quite a lot of cannibalization occurred but at least, this disposed of the runts who would not have survived very long in nature anyway. The remaining babies continued to grow well. If any readers encounter either species at any Aquatic stores, why not consider keeping them, as they are fairly easy to maintain and are extremely attactive fish, although quite a challenge when it comes to spawning? Not only that, you will be assisting conservation and perhaps helping to save these gorgeous Madagascan fishes from eventual extinction. 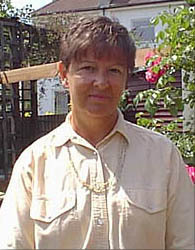 Guinane, Sonia. (June 29, 1997). "Spot The Difference Paratilapia polleni and Paratilapia bleekeri". Cichlid Room Companion. Retrieved on April 21, 2019, from: https://www.cichlidae.com/article.php?id=117.